We tried making cookies with less sugar. Our experiment was a huge success. The cookies turned out great. My daughter and I did not tell anyone that we used the blend of Domino Light All Natural Sugar & Stevia and NO ONE NOTICED a difference! NO ONE! I have been baking these cookies for almost 20 years. We aren't telling them, either. So if they actually take the time to read my blog then they will know about the change. Have you ever baked a cookie in a skillet? 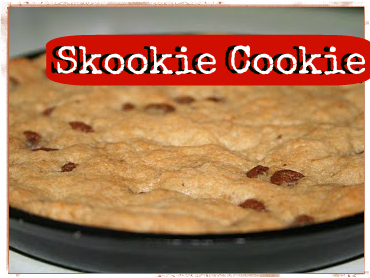 We have and it is just the right size dessert for one person if you use the Skookie Cookie Pan. We plan on using other cookie recipes for this, too. 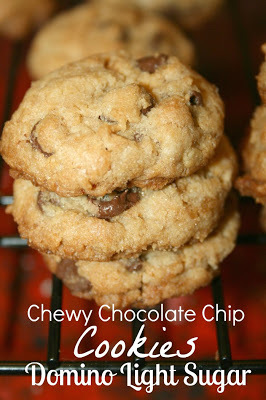 Enjoy this chocolate chip cookie recipe. It is a family favorite for over 20 years. There is an actual kit for the Skookie Cookie. It comes with individual size skillet pan and a lot of recipes. We used the cookie kit for this recipe the first time. Other cookie doughs can be used, too. Here is one of our cookie recipes below. Check the Skookie Cookie link for more details on this cast iron cookie.